Today’s announced by IBM that their Battery 500 Project team is achieving 500 miles in labs is a quantum leap. What does it mean for you and me? If you talk to most people about what it would take for them to buy an electric vehicle, EV, they will usually tell you; low price and a high range. Price is the result of mass production, the more you build, the cheaper it gets and decreasing costs will happen that way. But when it comes to range, this means a lot of research and development, sometimes decades' worth. Yet the question remains, if an EV could get you 500 miles on a single charge, would you buy it? The Battery 500 Project. Back in Aug of 2008, Dr. Wilcke realized the current state of batteries was not enough to power an EV for 500 miles. Indeed, if you wanted to make an electric car run 500 miles straight, you would have to slap on so many lithium-ion batteries that the weight would negate any benefits. In other words, the car would become so heavy it might reach 500 miles but at a crawling slow pace, something no everyday user would want to spend money on. The solution was simple, we needed a newer type of battery that was light and energy dense enough. This is how the Battery 500 Project was initiated at IBM under the far and wide reaching umbrella of the company’s Smarter Planet group. So Many Lithium Chemistry To Chose From. Back in 2008, all eyes were on lithium ion which showed the most potential. The over heating problems were being solved simply by maintaining a constant temperature. All of this was deemed to be good enough for small travels, 40 to 100 miles. At the same time, some companies were looking into different chemistries, such as lithium air, sulfur and zinc. The energy density of lithium sulfur was better than lithium ion, but it was still not enough and didn’t show much incremental progress. The other contender, lithium zinc did particularly well in the charge and discharge department, its longevity was good but it’s overall energy density is not ideal still., it still wasn’t the optimal solution. Much work has been done on all these, and three years later, the results show new incredible potentials. Lithium air currently shows the greatest potentials and has shown impressive numbers in lab tests. The Appeal Of Lithium Air. Lithium air has a lot going for it, at least in a lab environment. It’s twice the energy density as lithium sulfur and its overall weight makes it a better contender then either zinc or sulfur. However, as with any new technology, there are and were problems to solve. Those problems centered on the first commercially available cathode for lithium-ion batteries, cobalt oxide. Cobalt oxide not proved to be very efficient and destroyed itself after a few recharges. The IBM lithium air prototypes have shown impressive energy density and recharging capacity. They now yield 172 milliamp hour and in lab tests have achieved 10,000 milliamp/hr. with a 300 kg battery pack. However lab conditions are one thing, real life situations are different. So what can we expect? From Lab To A 500 Mile Reality. Don’t get too excited yet, lithium air batteries are at the very least 8 to 10 years away, and mostly will be commercially available closer to 2020-30. In real life, lithium air numbers point to 1,000 milliamp/hr, which should be sufficient enough to carry an average size sedan 500 miles. In many ways, battery technology has leaped over competition, especially when it comes to CNG and the futuristic sounding hydrogen energy media, called fuel cell. In a single decade, battery technology has advanced more than it has the past forty years. The promise of a 500 mile range electric car is just what the public needs at this stage of the uncertainty game. Can you image this on a zippy little electric roadster, such as the Tesla Roadster? This would give it close to a 1,000 mile on a single charge! Strangely enough, what more then 80% of the population truly needs for the daily commute is 40 miles or less, no more. We can be thankful IBM has gone back to its original place as a leader in various fields, opening arms and stretching its research muscles. 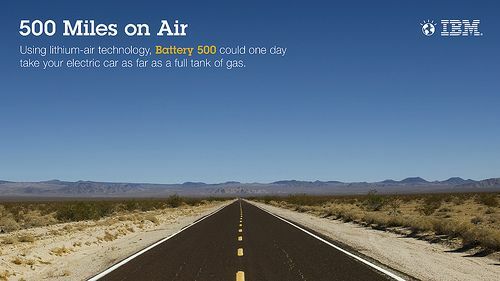 As of now, the appeal of lithium air that gives an electric car 500 miles on a single charge is the best news we have had from IBM’s Battery 500 Project so far for 2012. Any idea what the projected cost might be for this 500 mile range EV? Aside from my own coverage and my like the past two years of zinc-air, I still think it might be hard to beat the total economics (cost of car AND operation) of an electrified mild hybrid coupled with stop-start using a PbC nano-particle electrode, lead-acid battery, not to mention a split-cycle air hybrid ICE with an electric supercharger. Affordability for the masses with out government subsidies MUST be there to make a dent. HOWEVER ! What kind of MASSIVE battery charging system would one have to have to refill such a MASSIVE energy storage devise ? The FAST DC chargers now going up for the ChadimO Standard are MASSIVE, and very expensive. I fall back to a speech I made at the University of Washington some 20 years ago... "Personally, I don't care if we EVER see the 300 mile per-charge Electric Car. That is not where the problem with gasoline consumption. It is in our urban settings where everyone is driving their 400 HP, 5000 pound SUV's 10 20 30 40 miles a day ! Once an efficient gas powered vehicle gets out on the Open Road on a 500 mile road trip, in High Gear Overdrive, purring along at 60, 65 mph, the pollution per mile is very small compared to urban stop-n-go !" Hi Martin, you make a good point, most people don't need 500 miles, when 40 is enough for most daily activities. Part of the Men's Health Magazine race from NY to LA in two Ford Focus Electric was that they rediscovered the fun of taking time. A novelty these days. As far as cable, the industry is going toward inductive charging, which is at the present moment, 90% effective and rising. I'm a big fan of electric trains, since they are probably the most efficient way to transport human lives and cargo. It would make more sense to design cars that can go 300 miles on batteries and then hop on electric trains for longer stretches. Of course, this opens up a new can of worms by rebuilding something we should never left to rot, our railway system. Another casualty of the petroleum craze.